Claudia Williams has always loved art. As a child she was included in the Memphis College of Art Student Art Exhibition for her wire chicken. She eventually took weightier classes and workshops from renowned artists such as Matt Smith, Skip Whitcomb, Ken Auster, Peggi Kroll-Roberts, among others. She has taken advantage of studying with many of the nationally famous artists in her Nashville backyard—Anne Blair Brown, Dawn Whitelaw, Roger Dale Brown, and many more. She loves traveling and has been fortunate to travel worldwide to paint and take workshops. 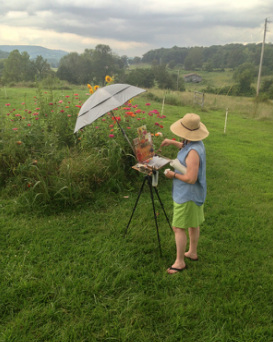 Claudia is a founding member of The Chestnut Group, Plein Air Painters for the Land, a nonprofit alliance of landscape artists dedicated to the conservation of wild and open spaces in Middle Tennessee, and has served on the Board of Directors and the Advisory Board.